These are my two newest drawings from last week. I'm getting ready for my site-specific work in July in Volyne at Galerie na Shledanou where I will paint some large murals. But I have to admit I'm not sure how these monkeys look when they are larger than life size. I finally had the idea for the monkeys to interact with something in the work, not just staring out at the viewer. Here the monkey is in trouble but he's not too worried because he has a stick and he's smarter than the crab. But there's also a light bulb rolling around and this could cause problems. If I had the skillz I'd make a computer game of a monkey fighting off crabs and light bulbs etc ... this is the random chaotic factor of trash and the piling up of objects. I am attracted to Katherine Bernhardt's work, for example, but it's also quite sloppy and quick. She's doing well because their is a humor to it and she has a signature style using bright pink flourescent paint and combining incongruous objects like parrots, cigarettes and rolls of toilet paper, etc. She spends half the year in New York and half the year in Puerto Rico and also has a thriving Moroccan rug import business. Although I think her work is also decorative trash to a certain extent, I have to admit I think she's doing pretty damn well. I like empty wine bottles because of the bell shape at the bottom. I read about the Japanese fairy tale about the Monkey and the Crab, but my work is only slightly related. My wife is involved in publishing books in Czech about Japan .. maybe we'll do these fairy tales too. I think they are interesting. 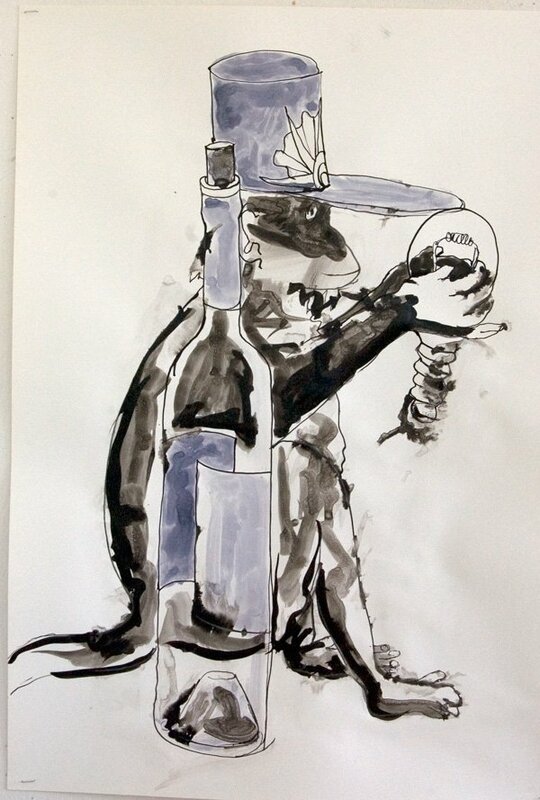 In the second drawing we have a monkey with a light bulb and a fancy hat. 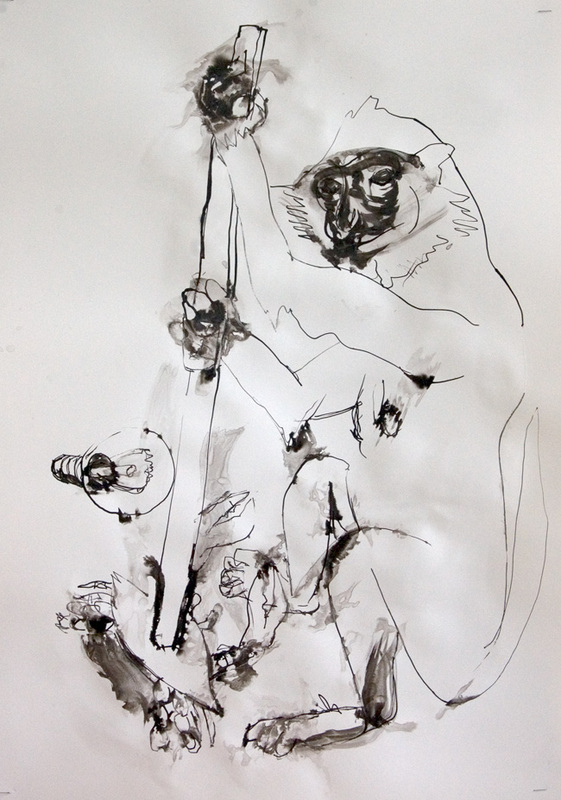 My work revolves around many issues but clearly the monkey and his light bulb are about man's relationship to progress and the way history repeats. Like Gauguin I am often asking Where Do We Come From? What Are We? Where Are We Going? ... for me this is one of the basic tasks of art, to help approach the mysteries of life. But perhaps my work is too illustrative and my style is too "primitive" ... I could perhaps make more money as an illustrator for children's books. Most of the work I see on Steemit is of the hobbyist photographic representational style. Often most of what gets made suffers from a conservative world view that is afraid of taking risks. Is that ultimately what it means to be post-modern? That we pretend all risks have been taken so we can excuse ourselves for not being brave? I wouldn't claim my work is original, although I do believe the artist should aspire to originality. And yet I am also wary of playing the modernist avant-garde game of art for art's sake .. I'm not necessarily interested in making art purely for an art world context. But is there any other?